I was looking for fun places to visit an easy drive from Johannesburg when I came across Sun City. This huge resort full of hotels and attractions sounded like the perfect place to finish off our African adventure in an easy, sunny place where we could be as active or inactive as we liked. After reading a whole bunch of Sun City reviews, I was determined to check it out. It was the perfect choice. Sun City is like nowhere else I have been before. It’s a huge resort, rather than a city, but I can completely understand why they call it a city. It’s massive with its own monorail and buses to get around, a water park, golf course, shopping centre, many hotels, apartments and a ton of attractions. It’s also located right next to Pilanesberg National Park so you can use it as a base to go on a safari. The “Sun” part also makes sense. We visited in the middle of winter and it was sunny and around 26 degrees every day (although it does cool down at night). It was great to get some sunshine before returning to winter in Australia. Sound interesting? 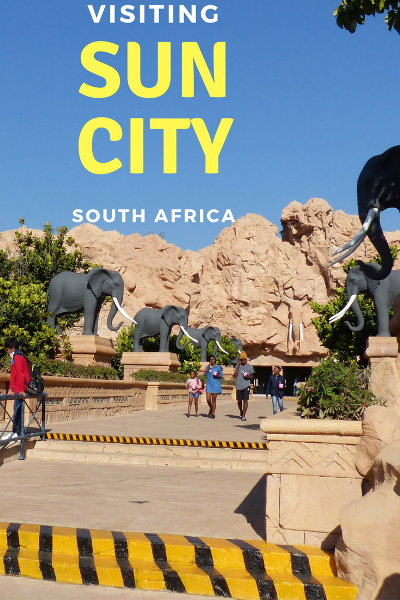 Below you will find our guide to what to do in Sun City, information about hotels in Sun City South Africa, visiting Sun City with kids and everything else you need to know for an awesome trip! Sun City’s Valley of Waves. 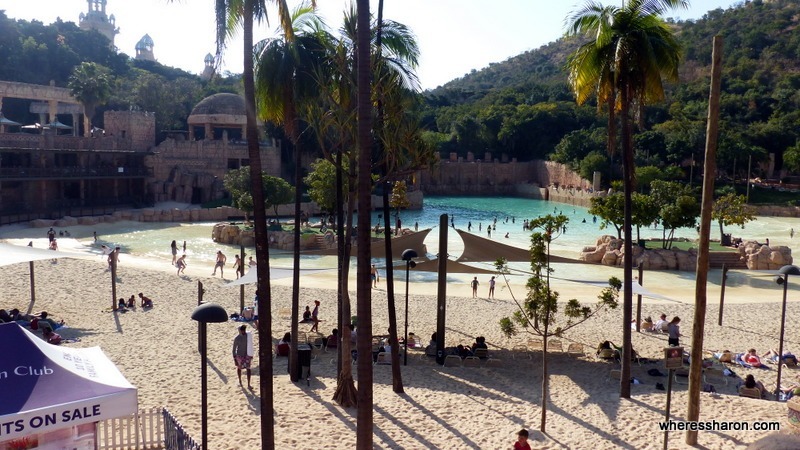 One of the top things to do in Sun City is the Valley of Waves – Sun City’s very own water park. It’s the most popular of the Sun City activities for day visitors. As water parks go, the Sun City Valley of Waves isn’t very big. There’s a wave pool with a beach, a lazy river and some water slides. Sadly there’s no kids play pool. That said, while there isn’t much what is here is good. The wave pool is a massive 6500 m2 and can churn out 2m+ waves. 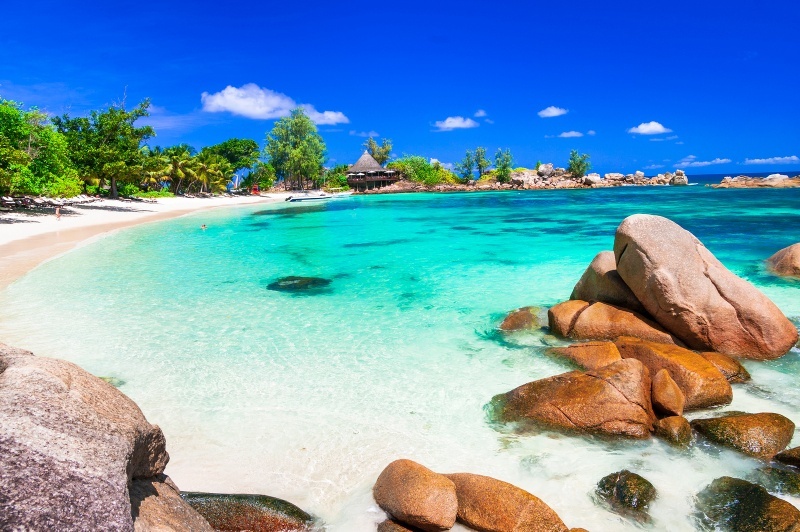 The beach is large too with lots of places to spread a towel and sit by the water. The lazy river is nice and long – maybe a bit too lazy as it takes a while to get around. Plus, randomly, there was a guy on a motorbike doing stunts at various places on the water’s edge. The best bit, though, is the “vibe” – like a big relaxed party. With the party tunes blaring (not too loud) it feels like we could have chilled our round the beach bit all day. It felt fun just being there – even if we weren’t doing anything. A note of warning though: the water isn’t heated and can get cold. I admit, heating a 6500 m2 pool is too much to expect even with a lovely mid 20s day, the wave pool’s water was apparently 16 degrees and felt much colder. The lazy river was even colder still and we didn’t like getting wet. If going during winter then maybe hold off until the afternoon. In summer it’d be awesome, although much more crowded. Even though the water temperature put a chill on our time we really liked our visit and had a great time. It’s a great place to go if you’re in Sun City with kids. Food and drink wise there are a couple of food outlets with a range of options. Plus the very good Brew Monkey restaurant which has some great food and a solid range of South African beers (craft and larger scale) at prices that are good value. There are also a few ice cream and drink vendors closer to the beach. In terms of other facilities, there are lockers at 60 ZAR for the day, but they are small and there are no big ones. Towels can be rented at 80 ZAR (+ a refundable deposit of 120 ZAR). If you’re staying at Sun City the rental is waived and the deposit can be charged to the room (and reversed once the towels are returned). There are small change rooms (I’d hate to see them if the place was busy) but they were well maintained which is more than I can say for some places we’ve visited. Annoyingly, there’s no baby change room for those little accidents. See https://www.suninternational.com/sun-city/activities/valley-of-waves/ for entry prices and more details. Entry is free for people staying at any of the Sun City accommodation options. On our way to the Maze of the Lost City. We found our way out…eventually. Connected to the Sun Central Mall is the very enjoyable Maze Of the Lost City. 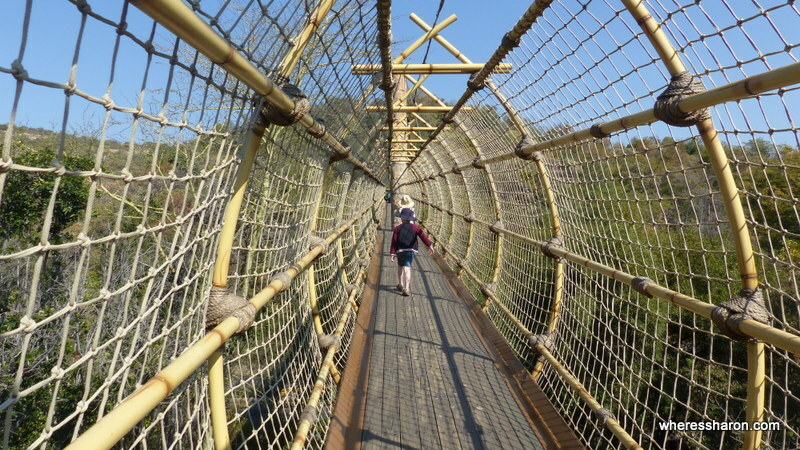 Entering from the mall you have to cross a 100m long suspension bridge to reach it, which is a nice bit of immersion. The maze itself isn’t that big but it was hard. Maze of the Lost City is one of those mazes where you can spend tons of time going round in circles in 50% of it until you find the one well disguised path/turn/gap that finally takes you to the rest of it and eventually on to victory. It’s certainly a challenge. We do enjoy a good maze and we all liked the Maze of the Lost City. Even if it did take some of us a while. Heading to Sun City without kids and think “pfft, nah”? Well, think again because the best bit isn’t the maze, or finishing the maze (which was very satisfying). The best bit about the Maze of the Lost City was the Palace of the Lost City itself which features a bar serving a selection of beers from local microbreweries, and at great prices too. It turns a fun maze into one of the best things to do around Sun City. Sharon and I both enjoyed a tasting selection of eight beers/ciders which includes a 500ml glass of the one you liked the best and a big basket of popcorn. All that for the crazy price of 50 ZAR (~AUD$5). And once you’ve finished that maze you’ve earned it. 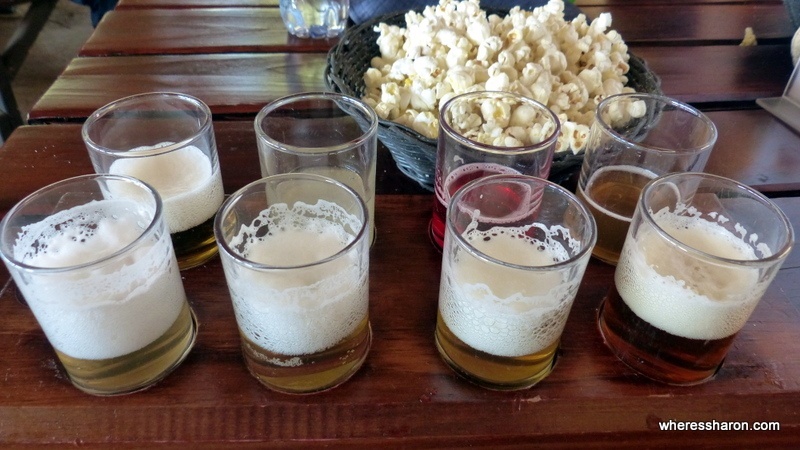 Your reward for conquering the maze: The beer tasting at Palace of the Lost City. There are drinks and a food menu for the kids, too. There are a couple of other Palace of the Lost City activities but recuperating and re-hydrating are head and shoulders above them. 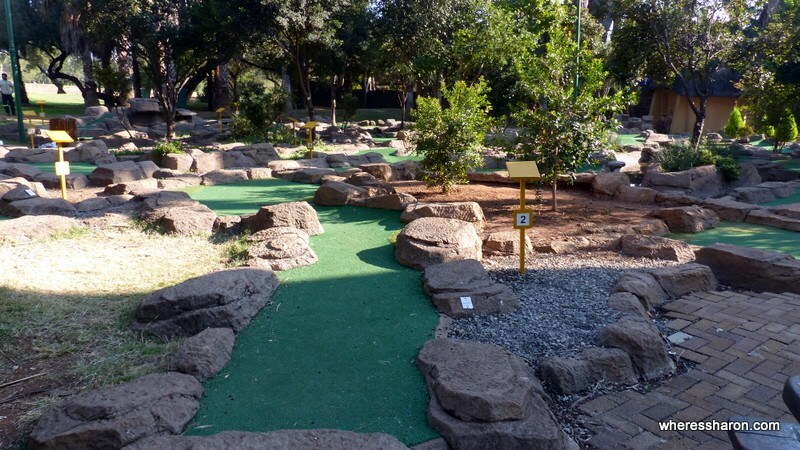 The Lost City at Sun City is also the location to other activities (like golf) but these are outside of the maze. See www.lostcitymaze.co.za for prices and more details. The Gary Player designed championship golf course. It hosts several Sun City events of the golfing variety throughout the year. 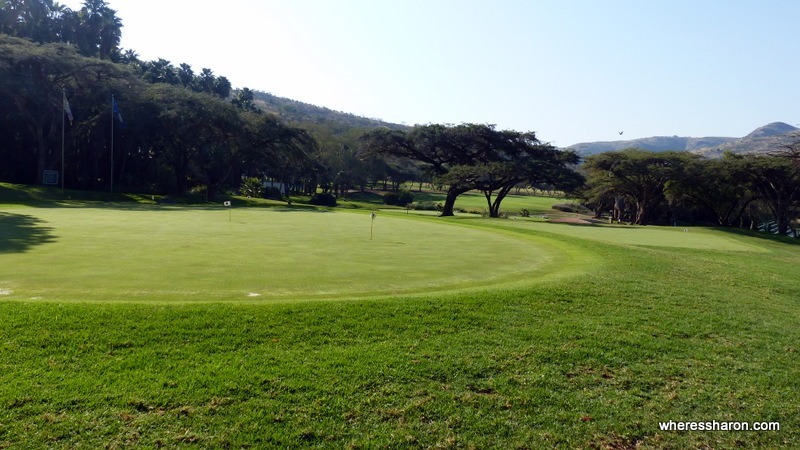 Sun City is home to two 18 hole golf courses. One, behind the casino and Sun City Hotel, is a par 72 championship course (which had just hosted a pro-tour tournament before our visit) designed by Gary Player, who plays the course now and then himself. The other is the Lost City course (adjacent to the maze) which apparently features a lake with 38 Nile crocodiles! Better bring spare balls – else the penalty for going into the water might be more than just one stroke. When you turn a corner and a rhino is coming in your direction!! One of the best things to do at Sun City is to visit Pilanesberg National Park which is right next door. 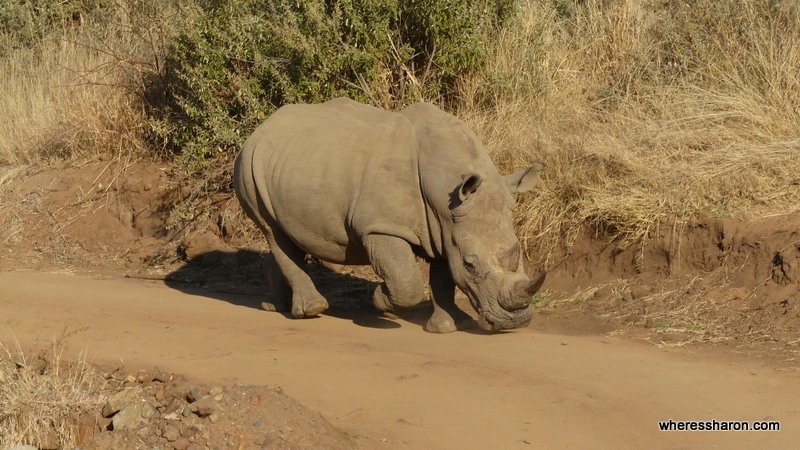 This is a great park to go for game drives to see the Big 5. It’s easy to organize safari drives and it only takes minutes to be in the park. I highly recommend a safari drive here. Seeing (large) wild animals up close is an amazing experience for anyone of any age. We actually spent a few days in Pilanesberg at a game lodge before visiting Sun City and this is a great way to do it if you have the time. 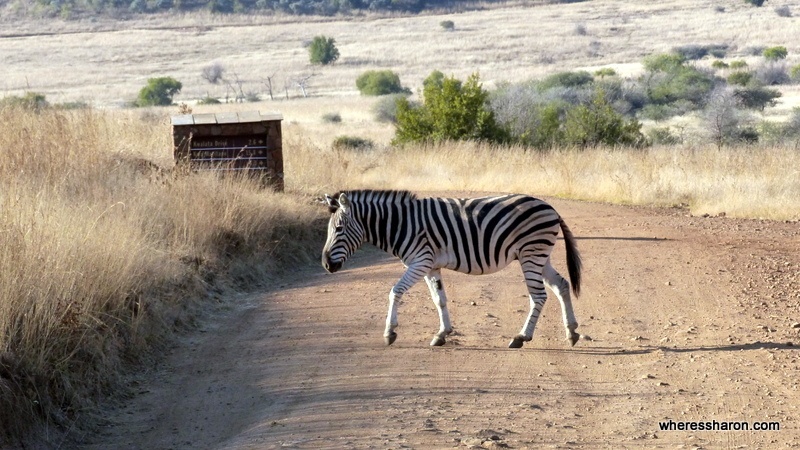 Otherwise a safari drive or two from Sun City is a good alternative. 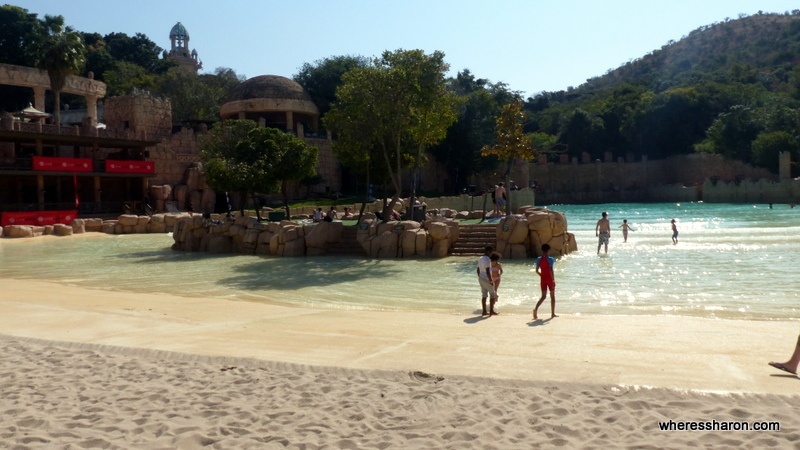 Along with the Valley of Waves, a safari drive is one of the most popular Sun City day activities. Read about our full safari experience here. Near the main entrance is Kwena Gardens, a crocodile sanctuary allowing you to get a close up look at some scary looking crocs. Because of all the activities to do at Sun City we didn’t get the time to visit here ourselves but it’s one of the Sun City fun activities to keep in mind if you’re planning your visit. See https://www.suninternational.com/sun-city/activities/safari/kwena-gardens/ for more information and prices. The Leeto-Kgolo village tour allows you the chance to see how the original residents of Pilanesberg used to live. One of the things to do near Sun City, you can see and experience some of the history and culture of the Bakgatla-Ba-Kgafela tribe who lived and still live in the area. There is a four hour tour available from Sun City covering four cultural sites. The restaurant in Waterworld by the man made lake. On the far side of the Cabanas and hotel/casino building lays a man made lake that’s been dubbed Waterworld. Most of the attractions for hotel guests mentioned below (especially those for kids) are clustered around or close to the lake. There are also a bunch of water based activities for adults or families, too. You don’t need to be staying at Sun City either, they can be enjoyed if you’re just on a day trip to Sun City, too. Para-gliding looked the most amazing but there’s also speedboat pulled tube rides or “water snake” rides (which looked like a banana boat) plus more family-friendly regular boats that you can take out. Water skiing and water skiing lessons are available, too. One of Sun City’s many pools, this one by the Cabanas. 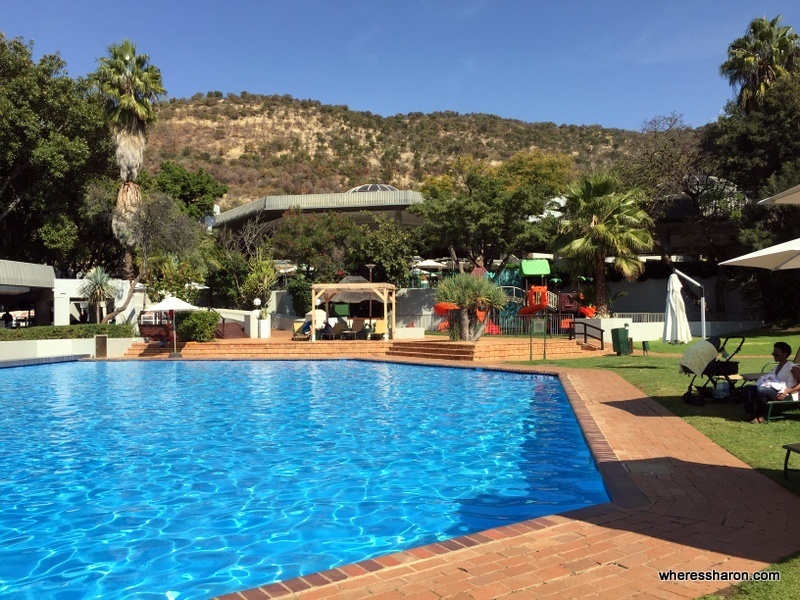 In addition to Valley of Waves, there are many pools hotel residents can use when they are looking for things to do in Sun City South Africa. 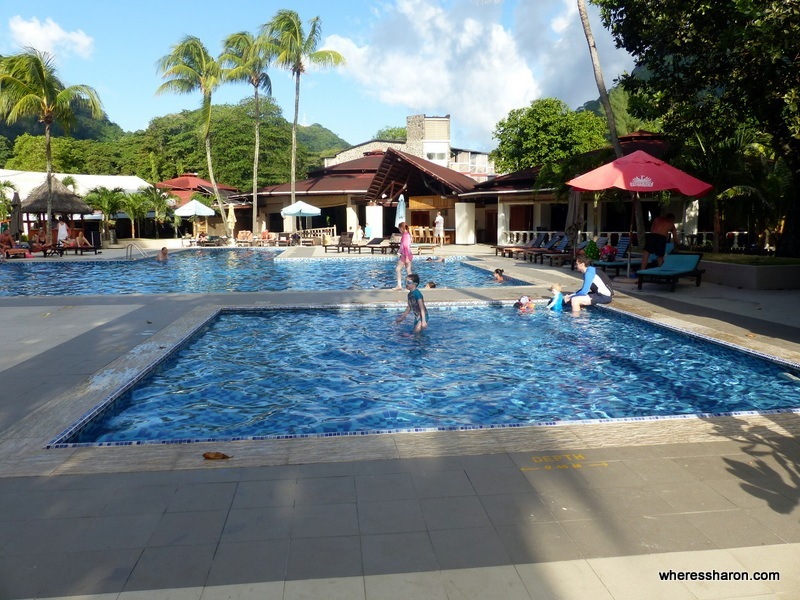 We stayed in the Cabanas which had a great pool area including a kids’ pool. A short walk from our room was also the lovely pool area at the Cascades which was more tranquil. Both had pool bars. Sun Central is the central point of Sun City attractions. Valley of Waves and the maze are just off this shopping centre. It is also home to some of the Sun City resort activities covered below. If you’re only visiting Sun City for the day then you might not have time to check its attractions out. In addition to the attractions below there’s also a great play area (covered in the kids section). There are also shops and many restaurants. We ate at least a meal a day here and found some great options. There’s also a pharmacy which has baby supplies. Located on the top level of Sun Central is another of the Sun City tourist attractions: the South African Hall of Fame. It’s an interactive centre dedicated to highlighting and showcasing South Africans that have made a notable impact in their fields worldwide and helped build the reputation of South Africa in the process. Almost all of the featured South Africans here are famous due to their contribution to one sport or another – with the notable exception of Nelson Mandela. Being quite new (the Hall of Fame opened in 2016) and having Samsung as a partner in developing the exhibits means that the Hall of Fame has some pretty cool interactive displays and activities. Not only can you read about the inductees, thanks to some VR headsets you can compete against them! Our kids are too young for that sort of immersive display but it’s pretty cool for everyone else. The interactive VR activities are a fun and impressive attraction in their own right. Technology aside it was still interesting reading about the achievements of the inductees (although I have to admit to not knowing most of them). While a visit to the Hall of Fame might not jump out when you’re thinking about what to do at Sun City, if you have the time a visit here is worth considering. It’s not great for younger kids but a visit here could fill an hour or several. Entry for people staying in Sun City is free! If you are on a day trip to Sun City then entry is 100 ZAR, although vouchers are available to get that down to 50 ZAR. The Magic Company is full of activities at Sun City. This is where you will find arcade games and a ten pin bowling alley. We didn’t visit ourselves but for older kids this is a more engaging place to spend a bit of time after a meal than the playground in the middle of the centre. It is located near the escalators that take you to Valley of Waves, towards the back of Sun Central. If you are looking for indoor and easy Sun City entertainment, there is a cinema in Sun Central. Three movies were playing when we visited with various session times. Sun City is an absolutely fantastic place to visit with kids. There is so much Sun City entertainment for kids and it really is a perfect family destination. We visited Sun City with our three kids aged 1, 5 and 7. 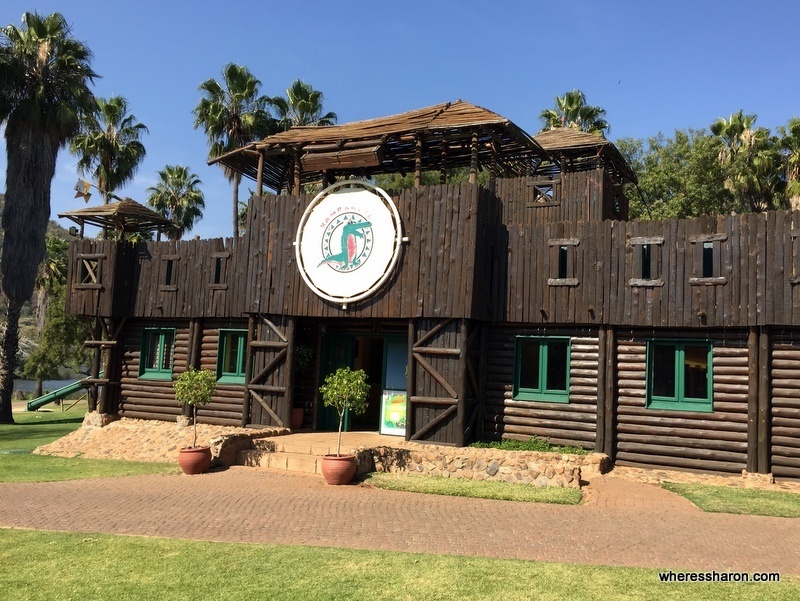 Sun City’s kids club is located in Camp Kwena, the wooden fort building down by the lake. There’s two sessions per day: from 9am to 1pm and 2pm to 5pm. 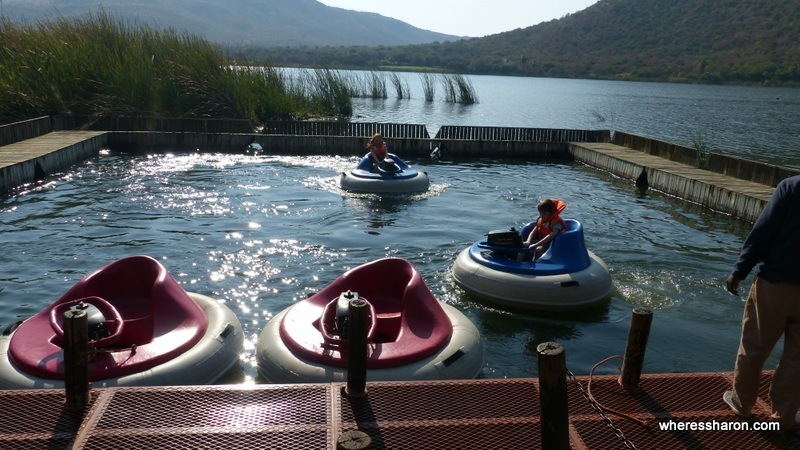 Each session costs 100 ZAR per child and includes a schedule of activities which typically include one of the other activities in the park (like the bumper boats or the train) that you’d normally have to pay for separately (but are covered by the 100 ZAR). Other activities include art or craft based stuff or games. There’s a different schedule for each day of the week, so there’s not much repetition. Plus within the camp itself, there’s a movie room, a (video) game area and a separate playground just for the kids club. For an additional 60 ZAR kids can stay for lunch between 1pm and 2pm, with food selected from a daily menu and provided fresh by the same kitchen that handles the pool bar. However to take advantage of this you need to book by 11am on the day. 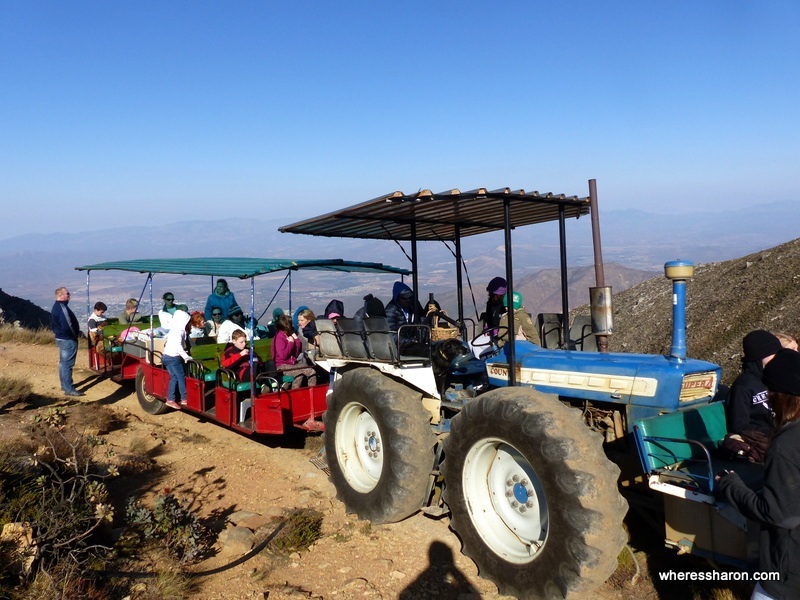 In addition to the daily schedule there are also excursions outside Sun City. On one of the days of our stay there was the chance for kids to go on a safari drive through Pilanesburg! Finders Keepers is a store as well as a place to go on a treasure hunt! 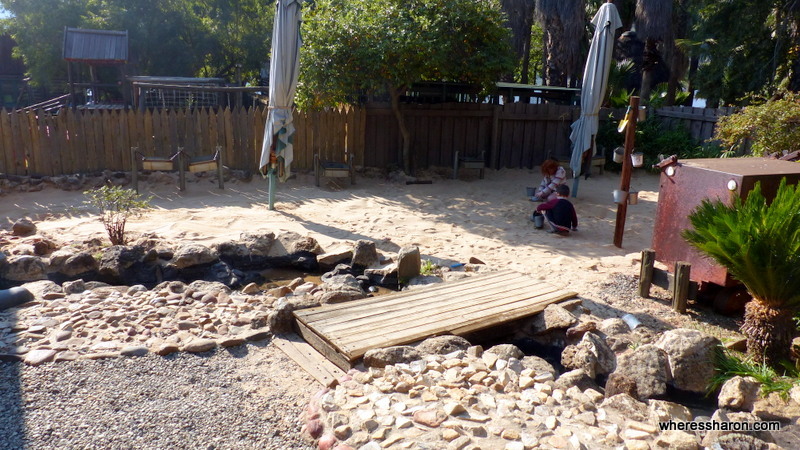 In this one of the Sun City things to do, you can pay to dig through big sand areas to look for buried treasure! There’s some gold nuggets hidden which give you the choice of some great prizes – like a keyboard or large, remote controlled car. There are also many little gems, rocks and medallions which are very easy to find. You get 15 minutes to find what you can with a spade and two buckets. The kids absolutely lapped this up and, although they didn’t any nuggets, they did find plenty of rocks and other little things that made them very happy. They loved this one of the Sun City activities for kids . It cost ZAR125 for a child for 15 minutes when we visited. Animal World at Sun City – not the best shot sorry. There are lots of big Sun City activities and prices to match but there are some great free attractions as well. 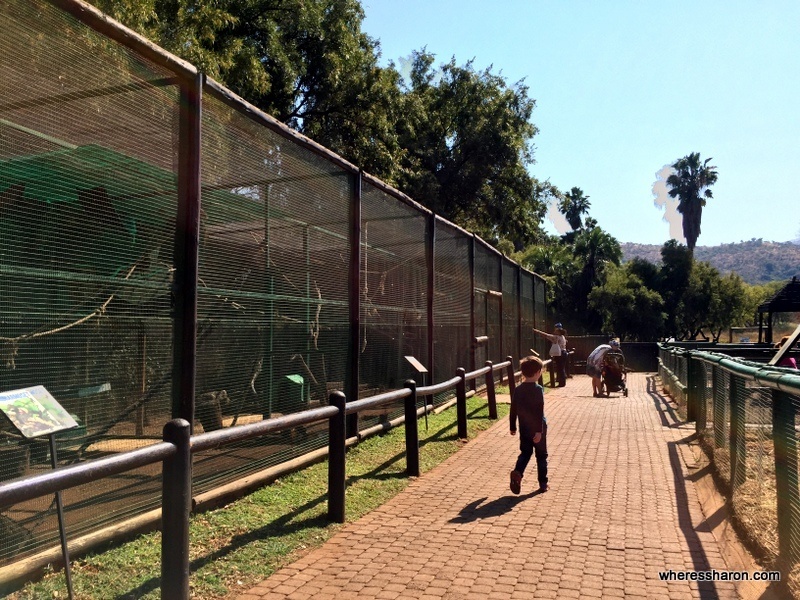 Opposite Kamp Kwena is the Animal World, an aviary and animal enclosure where you can see a range of birds and (mainly farm) animals up close. You can even touch some of them, petting zoo style. It’s simple but something S and Z enjoyed. It’s not very big but it was fun. The mini golf course at Sun City near the Cabanas. There are plenty of activities to do in Sun City without even needing to go far from your accommodation. Located near the lake and five minutes walk from our room in the Cabanas was a cool little mini golf course. The course is simple compared to others but not too simple it’s boring. S and Z enjoyed it and most kids would too unless they take their mini golf a little more seriously. Time wise, it took us 40 minutes to get around although we probably took longer than most would. Like almost all the activities to do at Sun City, there’s a price. One player, regardless of age can play for 50 ZAR, a round for two costs 90 ZAR and every extra person is 20 ZAR. For us that was reasonable although the value wouldn’t be as good if you were much faster round the course. All aboard! The Stimela train terminus. 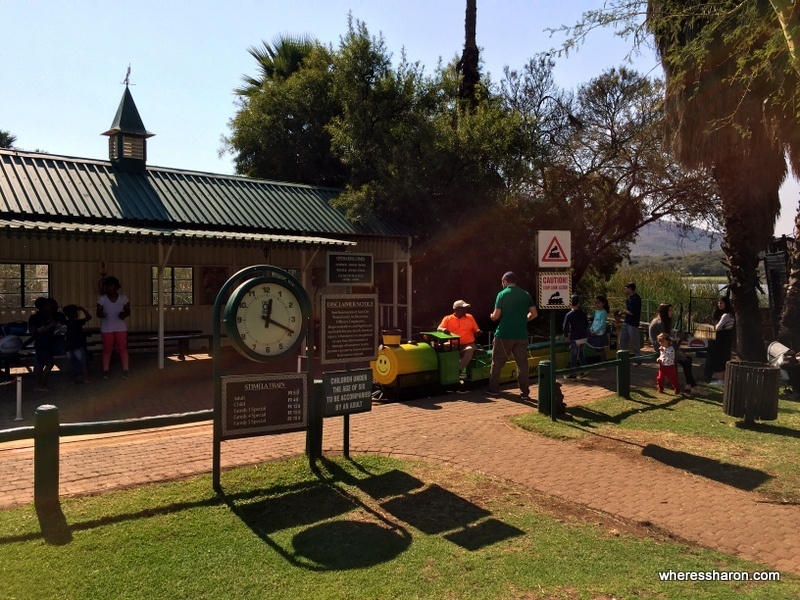 One of the many things there is to do in Sun City is the Stimela train. This miniature railway and train make a 10 minute circuit starting at the station down by the lake (next to the Long John Silver’s bumper boat ride). The track takes you into a special area behind the Animal Park where you ride in a cage tunnel with the birds and other animals free to roam around and over you as you ride along. It’s a view you get only from the train. Z had a ride and really enjoyed it. The train isn’t cheap, though. One ride (at the time of writing) costs 50 ZAR for an adult and 40 ZAR for a kid. There arefamily packages but they don’t save much. 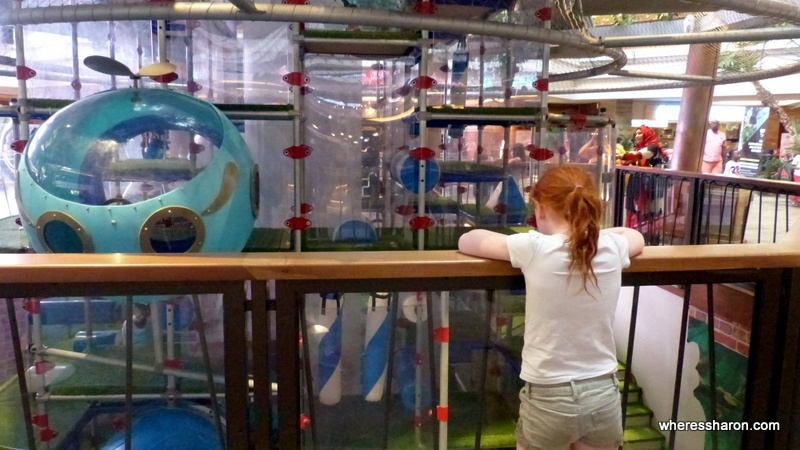 S looks at Sun City’s indoor playground – literally hours of fun. 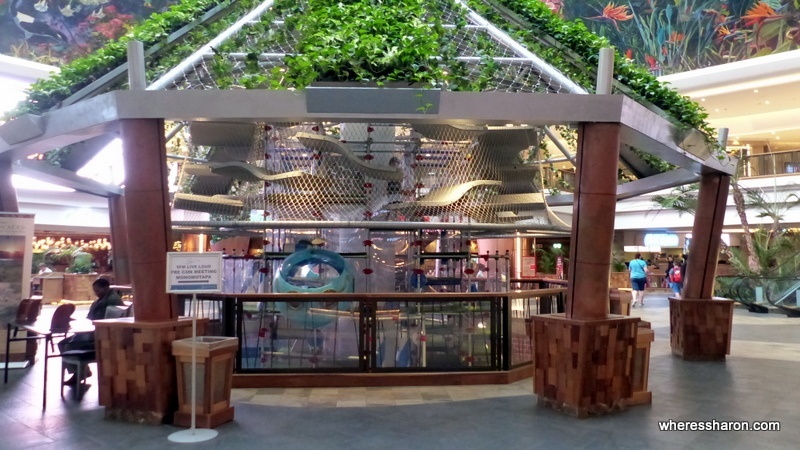 Inside the atrium of the Sun Central Mall is a great indoor mall play area. And it’s free! It’s several stories high and offers hours and hours of play-ability. Of all of the activities around Sun City with kids this is probably the one the kids enjoyed the most. Or at least spent the most time at. On the edges of the atrium are several restaurants all nice and close – some with tables that have a great line of site. Sharon and I were able to take J and enjoy a drink and watch the kids play happily. If they left we could see them and If they had a problem they could just come and find us. Super relaxing for all. The restaurants are good too. This one of the Sun City activities is the most fun. We could not stop laughing! No day visit to Sun City is complete without them. Basically these bumper boats are like the car variety that exists in amusement parks. You zoom around a small area of the lake bumping into the edges and into each other. They are safe and tons of fun! The only problem is that it’s only for kids and teenagers… Well it’s supposed to be but Sharon managed to have a turn. It’s a crazy rule really, rather than being based on size as there were teenagers using it bigger than Sharon anyway. They are located on the lake in the Waterworld City area. We highly recommend them! They cost ZAR100 when we visited for 10 minutes. There are quite a few hotels in Sun City to give you a whole range of choices. We stayed at the super family friendly (and cheaper option), the Cabanas. Our room in the Sun City Cabanas. 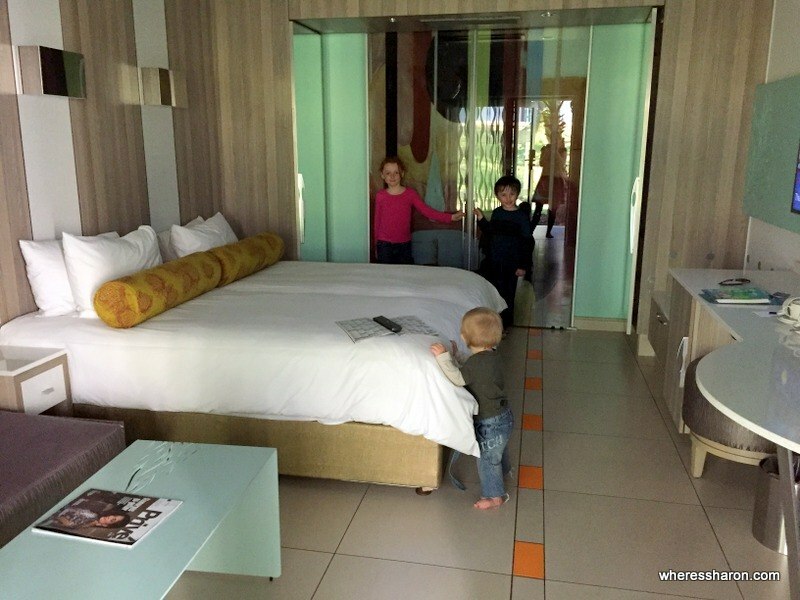 We stayed at Cabanas which is the three star option and the perfect choice if you are coming to Sun City with kids. There are tons of family rooms and many of the main Sun City kids’ activities are located here as well as a great pool, kids pool and a few playgrounds. Even the huge restaurant, which is home to the breakfast buffet, has its own playground. This makes it a very easy place to stay with kids and we never had to worry about them bothering anyone. The family rooms are for two adults and two kids and consist of a bathroom, two single beds pushed together and a sofa which folds out to a double bed for the kids. No one seemed to mind that we had Baby J with us as well. There are also cupboards, a small fridge, tea and coffee making facilities, desk area and a TV with plenty of options. The only big criticism I have of these rooms is that they are small. We had a cot in our room as well which left very little room. Thankfully, they are very well designed and organized and we were able to unpack all of our things for the 5 of us and keep all our belongings out of the way which meant it wasn’t really a problem having a small room particularly as there are so many fun things to do at Sun City. We were barely in our room. There are family rooms at some of the other hotels so you can book them if the size bothers you. Otherwise, I think Cabanas is the best choice for a family. Sun City is an easy drive from Johannesburg. We went straight from the airport there to Pilanesberg, on to Sun City and then back to Johannesburg for our flight home. Renting a car is the best way to do this if you are not local. It takes about 2.5 hours from the airport. 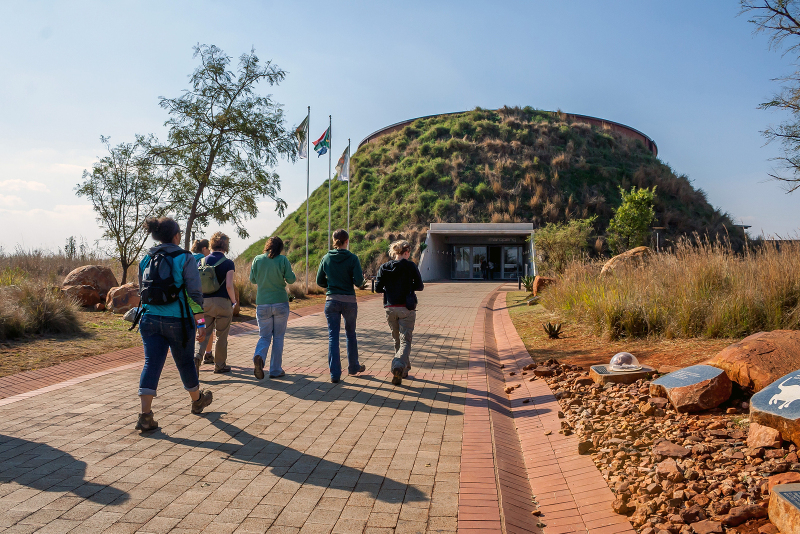 On the way back to the Johannesburg, we stopped at Maropeng at the Cradle of Humankind. This attraction is just superb and the perfect way to break up the journey. It starts with a boat ride that takes you back in time and follows humankind through evolution to today. It is basically a museum but presented in a very fun, interactive and informative way. I felt like I learned a lot and the kids were able to too. It fully engaged our 5 and 7 year olds and opened up their minds to the concept of evolution and how we came to be. They actually found the boat ride at the beginning a bit scary! But otherwise they lapped it all up. Sun City is a fabulous place for a vacation particularly if you have kids and want an easy place to go. We loved having a few days with lots of great food choices, so many easy activities in Sun City and good accommodation. We also loved how sunny and warm it was even in the middle of winter. My only criticism of the whole place is that we never came across a convenience store/supermarket. It would have been really handy to have somewhere to buy things like milk for our baby. There are plenty of places and vending machines to buy drinks but they are expensive and it starts to add up unless you do a run to a nearby supermarket (which is what we did). 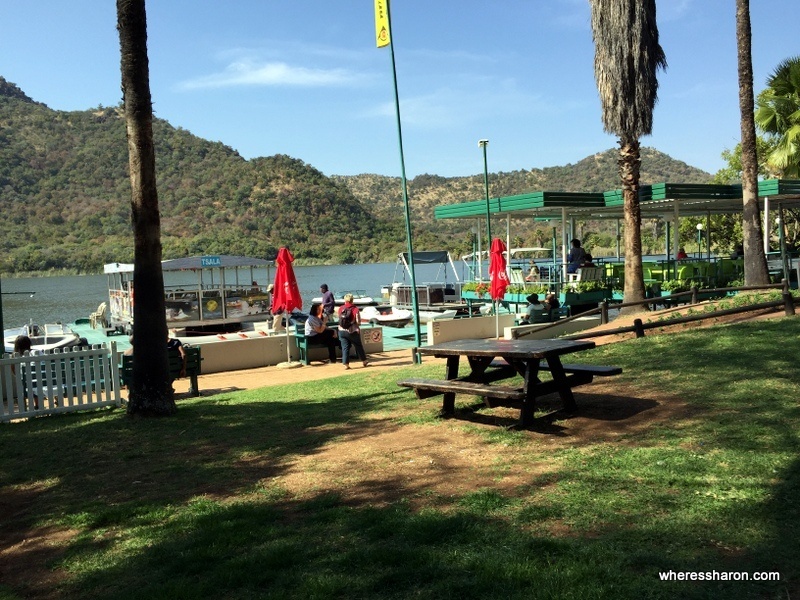 If you are looking for an easy place to relax on your African vacation, definitely consider visiting here especially if you are flying through Johannesburg. 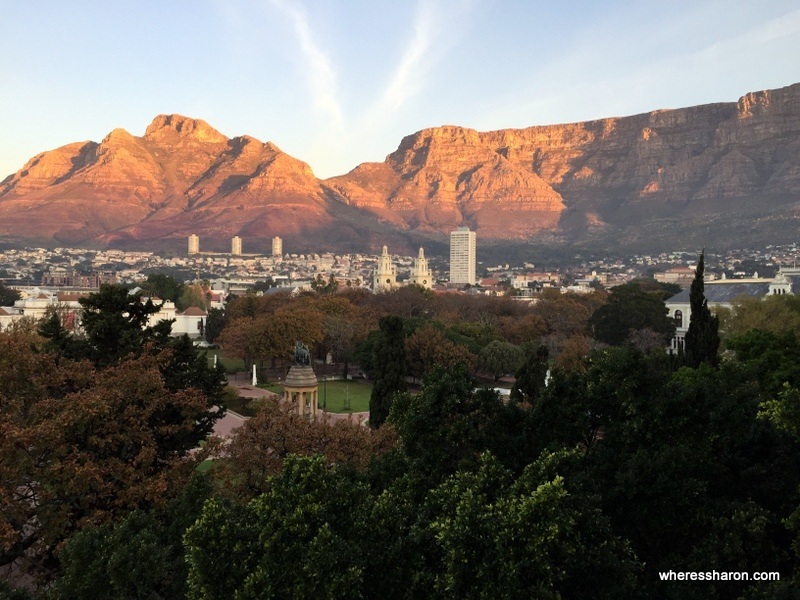 It’s a very easy drive here and it’s a good alternative to a Johannesburg stopover. It’s also a ton of fun and I can definitely see us returning! Sun City looks like a great place full of fun and adventure. We make a living traveling with our 10 year old daughter and it’s always great to know where to stop off for a little kid friendly fun!